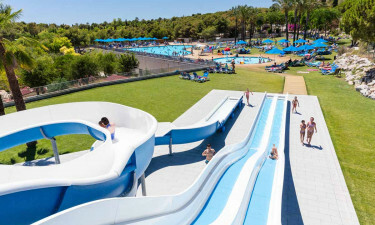 Located between Barcelona and Tarragona on the Mediterranean coast, the Vilanova Park holiday camping site is conveniently situated just 2 to 3 kilometres from the nearest town and at about 5 km of a number of long, wide sandy beaches. Do you love travelling, but loathe campsites that do not offer everything you need to enjoy a great camping holiday? If you are coming to Catalonia in Spain, you will find camping luxury and all the quality facilities you need and deserve in a mobile home at VilaNova luxury camping park – a unique and attractive site. If you have already decided to stay with Lux-Camp and would like to go ahead and make your reservation at this luxury camping site today, please get in touch. Why choose Camping VilaNova Park? Below you will be able to read more about the reasons why you should choose to go on holiday to VilaNova Park. This site is ideal for families and adults who appreciate luxury. 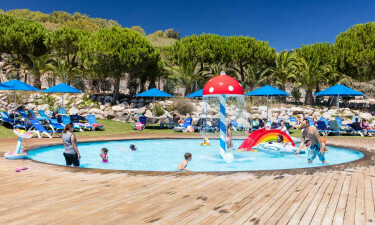 Apart from relaxing in the Mediterranean sunshine, swimming pools or the spa in the wellness centre, there are a number of activities including the children’s park and organised groups. Alternatively, choose from ping-pong tennis tables and a bowling area, as well as volleyball and tennis courts and a mini golf circuit. Electricity and gas is supplied. Wi-Fi is available, in addition to computers with Internet access in the main building. The campsite is well equipped with facilities for the disabled; palm trees provide shade at midday and the lawns are trimmed, with floodlit fountains adding to the relaxing and intimate night time ambience. The campsite offers transfers to the local beach and airport - and even cycle hire, if you enjoy getting around on a bike. You will find a number of bars and cafeterias nearby and a railway museum, of interest to children and many adults alike with exhibits from train, track and rolling stock. The beautiful beach at Vilanova is long, wide and sandy - so ideal for swimming, surfing and sailing. Port Aventura theme park is within thirty minutes' travelling time by train down the coast, or by road. To the north is the chic and modern city of Barcelona, Spain’s third city. The on-site food shop also sells bread, with a snack bar too. 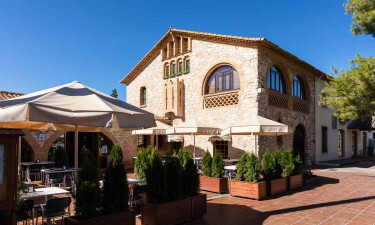 The site restaurant and bar is in a restored Catalan farmhouse, while the nearby fishing town of Vilanova i la Geltrú has various restaurants serving delicious freshly caught seafood dishes.